A Gymnastics Scoring System providing robustness, reliability and flexibility. We can either score your meet for you or provide you the ability to score your own! Web enabled meet planning, which makes it super easy to discuss scheduling options. 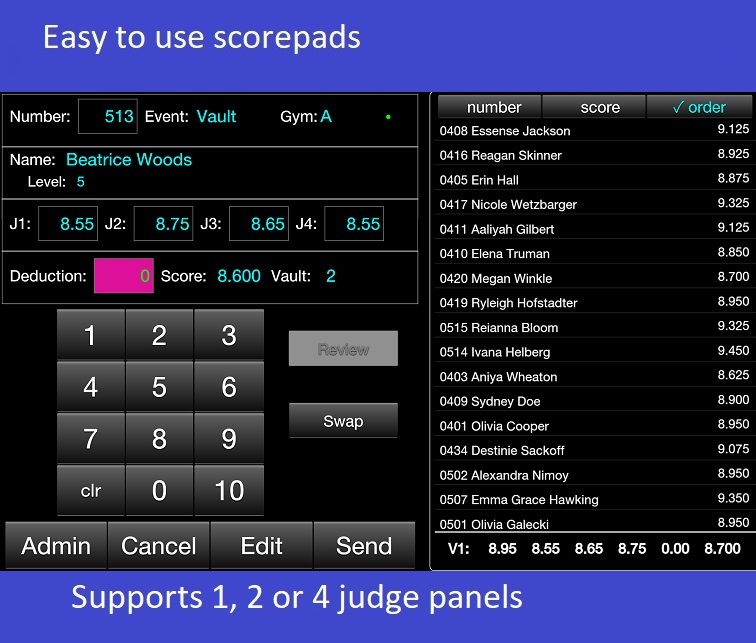 Easy to use touchscreen scoring devices, designed by a judge with features they enjoy. We always bring plenty of backups! 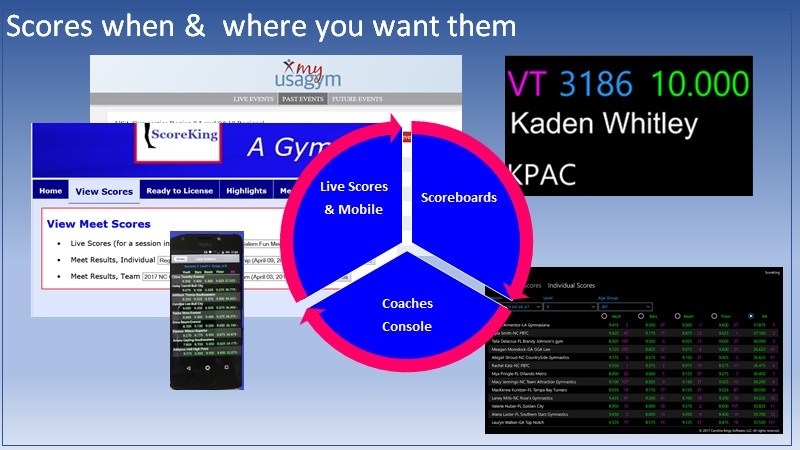 Live Scoring to scoreking.com and to the USA Gymnastics myUSAgym app for easy access to scores by all. A Coaches Console that puts scores at their fingertips on a nice big 24" touchscreen display. Hardware redundancy: We will bring 2 of any required equipment, plus more scorepads than required. We include a continually replicating database on a backup server to protect the "coffee spill on the laptop". Your meet scores are important to us! Final Meet scores available on this site as well as others. A Leader Board with Team and Level standings provided for the coaches area for large meets. Able to support 1-many displays. Default configuration of two 40 inch flatscreen displays are provided, each alternating scores for two events. Reports that support flexible gymnast groupings ala USA Gymnastics style, AAU or others. Supports both womens and mens gymnastics events. Interested in your own ScoreKing License? Meet Success continues in 2018! ScoreKing: 04/23/2019, 8:42 am © 2015,2018 Carolina Kings Software LLC, All rights reserved. Check out our mobile version! Our software has the features needed to hold reliable meets, at an affordable investment price. It is available to license for use in your meets with flexible terms. Awesome flexibility in the scorepad device choice! Meets have been run successfully on Amazon Fires, Winbooks, Acers, Apple and Lenovo devices as scorepads among others. Don't spend more than you need to on scoring devices! A scoring server built with robustness in mind from the ground up, including a battery level monitor that lets the scorekeeper know the battery status of all the scorepads at all times, a scoreboard operations console to remotely manage wirelessly connected scoreboards, and a wireless connection manager to manage the wireless connections of the scorepads. Ability to support from 1 to many displays, with flexibility of mapping events to displays as you wish. Hot Standby capabilities that minimize risk to your meet. Meet Schedule Estimator to help you create a schedule that works. Support for a rolling Leader Board with Individual, Team and Level standings and a Coaches Console that you can provide for large meets. A medal estimator, to prevent that awful "Oops" moment when you realize you are short some medals! ScoreKing Coaches Console in action. 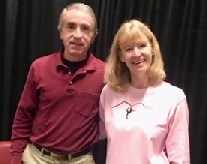 Another memorable experience in Asheville! Over 1400 competitors, wonderful Frank Sinatra tunes and guys in tuxes looking dapper...where else but at The Gala? Here's a picture of the two of us on the last day of the meet, happy to have experienced another great weekend. 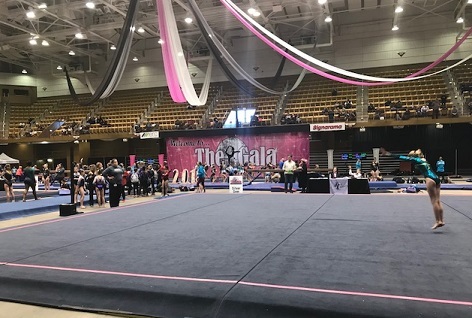 Morgan's Gymnastics hosted a well run state meet in the Smithfield Recreation & Aquatics Center December 1-2, 2018. 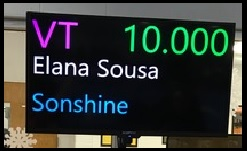 Just one of the awesome things we saw was a perfect 10 on the level 3 vault from Elana Sousa of Sonshine Gymnastics. Congratulations to Elana and to all the gymnasts present at the meet who showed us what great gymnastics looks like. ScoreKing previewed its new Floor Manager, that helps to manage the bump-in warmups on floor. 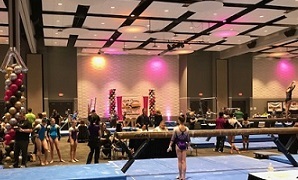 Managed from a tablet with easy to use interfaces, the names of the next gymnasts who should take the floor are displayed on a screen adjacent to the floor. All in all, another great meet! The pictures don't do justice to the wonderful balloon display at the Bronze & Silver State Meet. The girls were of course in top form too, so it was truly an awesome meet! 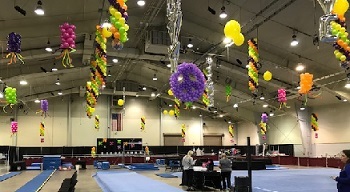 It was held in Winston-Salem at the Fairgrounds sponsored by Central Carolina Gymnastics. The ScoreKing Coaches Console showcased new functions such as easily displaying the scores that were contributing to a team score. It remains a hit anywhere we take it! 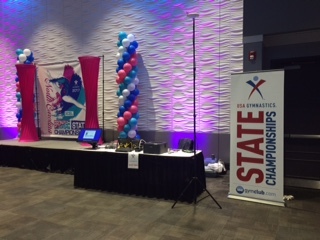 Rose's Gymnastics did another great job hosting the 6-10 State Meet in the Greenville Convention Center. The place always looks terrific thanks to great lighting and pretty decorations provided by obviously talented volunteers. Another wonderful state meet for the books! The first meet I've been to with nice looking guys in tuxes escorting the gymnasts out to the floor! And spotlights and flowers for the Girls! Well Done! The ScoreKing software turned in its own spotlight-deserving performance, too, of course! 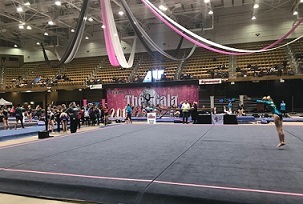 Hosted by Kidsport in the Greensboro Colisseum April 7-9, Meet Director Sarah Myers and her fabulous friends and gym families put on a terrific meet for the girls to show their awesome skills. ScoreKing turned in another smoothly running scoring experience, one that Sarah termed "a flawless" performance. We're happy with that! LemPossible and their wonderful supporters made it possible to enjoy a great state meet in their neighborhood! 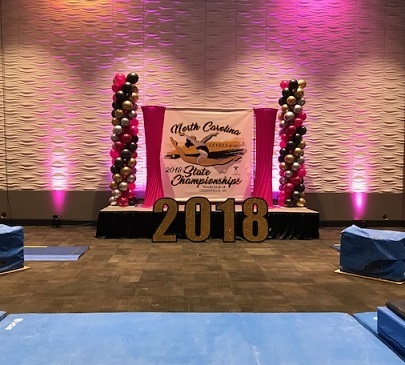 Held Mar 31 - April 2 in Trinity, NC, our Gold, Platinum and Diamond gymnasts showed what they could do! The touchscreen Coaches Console was once again a hit with coaches. Next stop for ScoreKing...the Region 8 Level 9-10 Championship. 2017 NC Bronze Silver State Meet: Greetings from Greenville! Rose's Gymnastics hosted a wonderful state meet March 25-27,2017 at the Greenville Convention Center. Beautiful gymnastics in a lovely facility. For ScoreKing, it was the maiden voyage of our Coaches Console on a 23" touchscreen. It was a hit! 2016 NC Compulsory State Meet: Great Meet on the Coast! 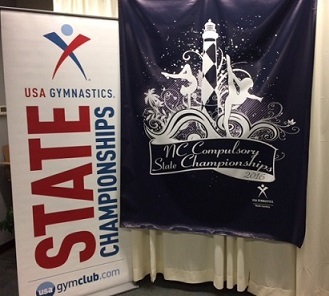 Congratulations to the 677 gymnasts who turned in great performances and to both New Bern Gymnastics and Crystal Coast Gymnastics for hosting a wonderful meet. A well run meet at a beautiful location... what else can you ask for? August, 2016: The first year of ScoreKing's existence has come to a successful close! 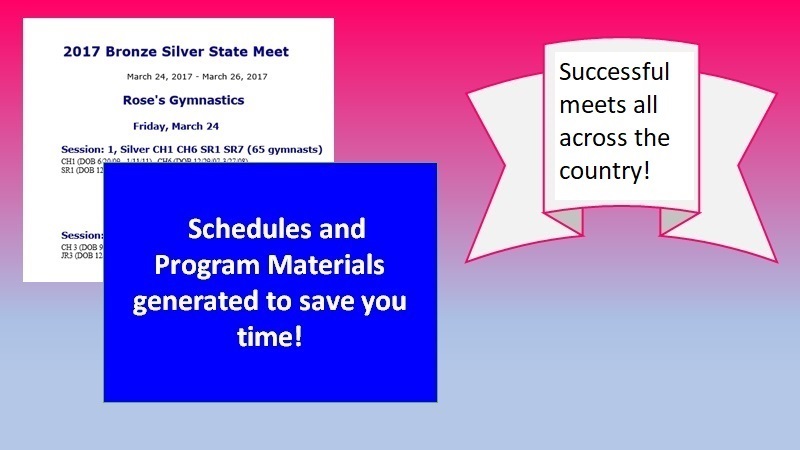 The scoring system was used for over 26 meets - including two State Championships, lots of USA Gymnastics Invitationals, High School Conference and State Meets, PGL and Stars - with happy customers all around us! Thanks to all the gyms that gave us a great first year! Lots of new functions were added as the year went on, including Live Scoring, a Leader Board for the Coaches' room and new and improved reports. Customers who used the web interface for planning their meet were very positive on the experience. And on the device side, support was added for Android and Windows 10 offering flexibility for clubs that are interested in licensing. 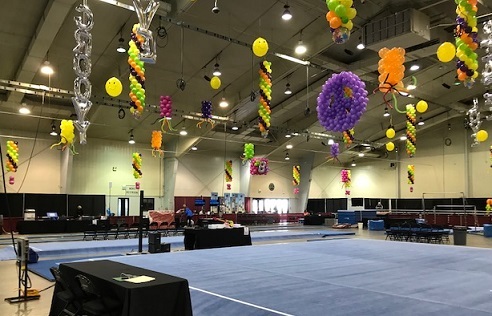 "Well Done" to Gymnasts, Coaches, Judges and Kidsport for a truly awesome meet! 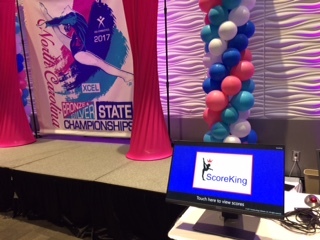 For ScoreKing, it was the maiden voyage for our "Leader Board" that scrolled Team and Individual Results in the Coaches' room, a popular feature. Live Scoring was provided as well. A great weekend for those of us who love this sport! 2015 NC L2-5 State Meet: What a weekend! 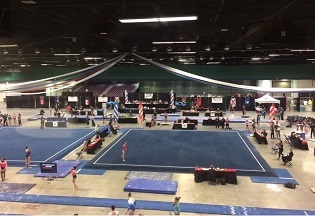 Congratulations to the 688 North Carolina gymnasts who competed at the 2015 NC Level 2-5 State Meet! The competitors performed some beautiful routines to entertain the crowd at the Smithfield Recreation Center. Morgan's Gymnastics did a terrific job of hosting the event. 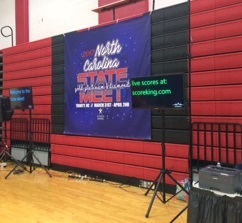 The sound system was provided by Audiosmith, and ScoreKing provided the scoring system. 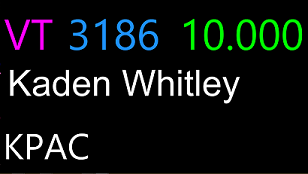 We want to give a special congratulations for the first 10.0 score flashed on our displays! ScoreKing was developed by two people with a combined 50+ years of software development experience with IBM. Julie King, a former IBM VP and current National rated Womens Gymnastics judge, who has also written GymJAS, the judge assigning software now in use by 42 states. Ralph King, a former senior technical expert in IBM Store Systems software where reliability was of primary importance. Our goal: to provide a scoring system that is easy to use and truly robust! 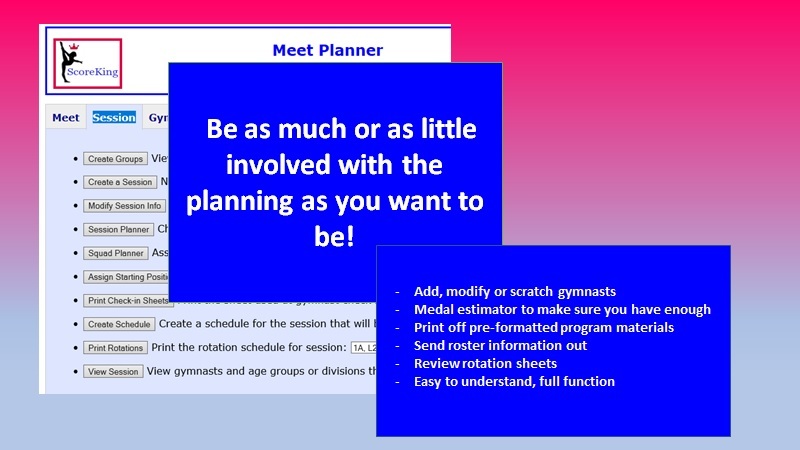 To round out Carolina Kings Software, add in Jessica King and her awesome website GymnasticsHQ.com that provides a great resource for parents and gymnasts passionate about this sport. And check out the new Skilltrakker.com system! You can contact us at carolinakingssoftware@gmail.com. We look forward to hearing from you.